The Missa Solemnis is Beethoven's second Mass, which he began 1817 and shaped into a monumental work that threatened to break out of the traditional dimensions of liturgical ceremony. The outward occasion for the composition of the work was the enthronement of his illustrious pupil, Archduke Rudolph, as Archbishop of Olmütz (Olomouc). "The day on which as High Mass of mine is performed at the celebrations for Your Royal Highness will be the finest day of my life," he wrote to the Archduke in June 1819, "and God will give meHis light, so that my feeble powers contribute to the glorification of this festive day." But the work cast such a spell over Beethoven that it was not finished until two years after the enthronement, which took place on 20 March 1820. The early sketches go back to the spring of 1890 and possibly even further, and are often to be found alongside sketches for the "Diabelli" Variations - about the time in which the last three piano sonatas were composed. Yet the finished work no longer shows any trace of the struggle which its composer had even over the smallest details - of the many attempts necessary, for example, to find the incomparable, lapidary final form in the four notes of the call in the Credo which could satisfy Beethoven's conception. In his musical interpretation he not only followed the meaning of the individual sentences in the text of the Mass but even made a constant search for the most appropriate way of expressing individual words. 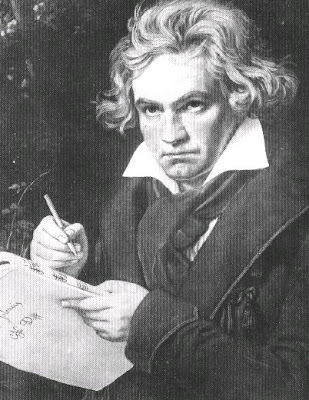 The following note, in his own hand, shows how Beethoven himself took his bearings: "To write church music, go through all the church chorales of the monks, etc., work out the sections in the most accurate translation with the perfect prosody of all the Christian psalms and hymns." There is, in fact, a whole series of notebooks in which Beethoven wrote out the German translation of the Latin text of the Mass word for word, partly with exact marks of scansion, i.e. noting the emphasised and unemphasised syllables for the correct declamation of the text. Writing to the Bonn publisher Simrock on 19 March 1821 about a translator who was to prepare a printed edition with German texts of the Mass, Beethoven remarked: " The translator is himself a musician, he is familiar with my own concepts of the Latin texts, and as a ready writer is capable, thank God, of producing a model." To be able to present a personal standpoint so decisively could only be the result of an intensive struggle over the problems of the text. The first full performance of this Mass took place not in Vienna, but in St. Petersburg. It was arranged with the help of the friendly Prince Galitzin and the performance was given on 6 April 1824 by the Philharmonic Society there. During Beethoven's lifetime only three movements were performed in Vienna, the Kyrie, the Credo and the Agnus Dei. They were presented under the title of "Hymns" (in view of the severe regulations about the concert performances of church works) at the great Beethoven Academy on 7 May 1824. The length of the work should not lead to the false conclusion that it was conceived for the concert hall rather than for the church. 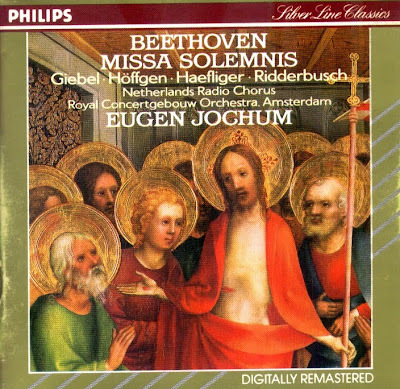 The Missa Solemnis was originally intended for the lengthy ceremony of the enthronement of a bishop, and in addition the extensive movements, the Gloria and Credo, belong in the setting of a full liturgical service, where they would have a less disruptive effect. Besides, unusual length is not a peculiarity of this Mass only: even earlier Beethoven had shortened his piano sonatas by whole movements on the advice of his friends, and later he was to do the same to his string quartets. In a letter to Andreas Streicher of 16 September 1824 he makes clear that, in working on this great Mass, his deepest concern and chief intention had been "to arouse and establish permanent religious feeling in both the singers and the audience." Anyone who has heard with attentive ears Beethoven's musical confession, on the texts of the Mass, in a work which he himself described as his greatest, will also understand the simple greatness of the words which stand at the head of the first page of the manuscript: "From the heart - may it go into the heart again". The DCD was released by Philips, P 1971/C 1990, (ADD). Philips 426648-2.